Children's among the first to acquire ROSA technology. Neurosurgeon Matt Smyth, MD, and his team began using ROSA technology in Februrary 2016. These children will be able to return to their daily activities in a matter of days without any sign they went through surgery. This month, St. Louis Children’s Hospital became the first hospital in the region to employ the use of a new generation of robotic neurosurgery technology – technology that has cut surgery time from upwards of six hours to two, and recovery time from weeks to days. The ROSA robotical surgical assistant, from Medtech Surgical, was approved for use in the United States in 2014. A year and a half later, the technology is in use at only the nation’s most advanced medical centers. While neurosurgeons at Children’s expect to expand the cases in which they can apply the use of ROSA, pediatric neurosurgeon Matt Smyth, MD, says it will most immediately benefit patients struggling with epilepsy. “This new technology not only assists our team in identifying where in the brain seizures may be occurring, but also helps us target these areas with greater precision during surgery to provide families with answers on how to stop the seizures,” Smyth says. 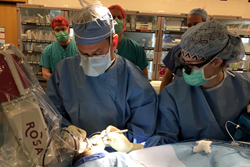 Previously, if he was looking to better isolate the source of a patient’s seizures through surgery, Dr. Smyth would have to perform a craniotomy, a lengthy procedure in which he would remove a portion of the patient’s skull. ROSA eliminates the need for the craniotomy. Referred to as a stereoelectroencephalography (sEEG), the robot assists the neurosurgical team in accurately placing electrodes in areas of the brain where abnormal electric activity may be occurring, helping to pinpoint the source of seizures. One other benefit of ROSA has resonated with patients. In the case of a full craniotomy, the medical team had to shave a patient’s head. ROSA allows for use of a small burr hole, which requires nothing more than removal of a small amount of hair.